While you might find a few other guests there, this unnamed lagoon is definitely post-card worthy with the glimmering blue ocean crashing onto the sandy shores. To top it all off, almost every time I’ve visited this lagoon, there’s been a Hawaiian green sea turtle (or two!) swimming around! Be aware, though, that Hawaii law states that you must stay at least 50 yards from the turtles for their health and safety. ​TELL ME HOW TO GET THERE!!! Take the exit off of H-1 West to Ko Olina. Make a right turn at the sign that says “Lanikuhonua”. There will be one small section of parking before the gate reserved for those going to visit the lagoon. There are only about eleven spots, so get there early! At the one end of the parking area, there will be a sidewalk that leads to a sandy path on the left. Follow the path to the end and enjoy your time at this secret oasis. *Note: Starting at around 5:00 p.m., a local luau begins nearby, so it might get a bit more noisy and crowded. During the day though, it remains a perfect place for rest, relaxation, and enjoying your vacation. 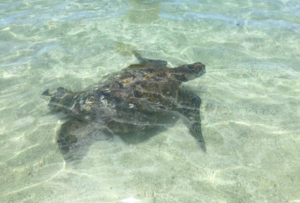 *Update: Since writing this post, the lagoon has become significantly more crowded, but it is still a great place to see a Hawaiian green sea turtle or two! Does this area sound like the spot for you? 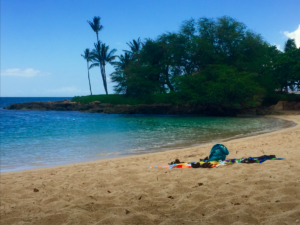 Check out the Ultimate Guide to the Ko Olina Lagoons! Or do you want to know about other turtle-spotting areas on Oahu? This post is the perfect guide.